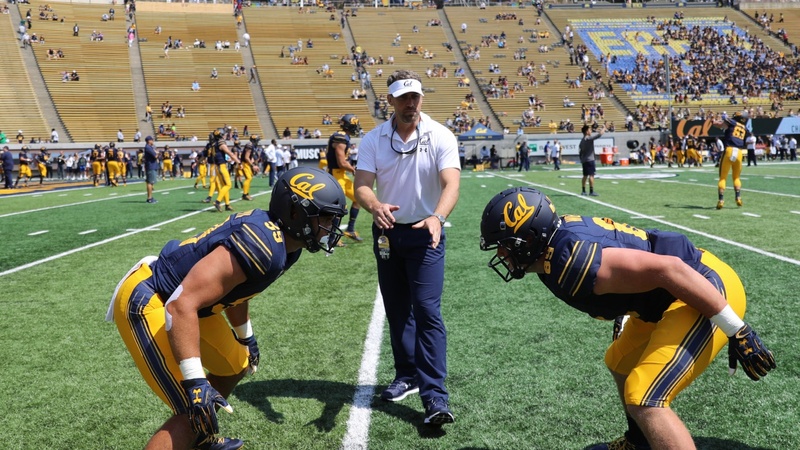 Cal’s pair of senior Jordan Kunaszyk and junior Evan Weaver constitute as dynamic an inside linebacker tandem as any that exists in college football. In the tackles per game category they are second (Kunaszyk, 11.4 ) and third (Weaver, 10.7) in the Pac-12. Their combined average of 14.2 solo tackles per game leads the nation. They work together like a well-oiled machine, moving in synch with one another to disrupt opposing offenses and are a prime reason the Cal defense, two years ago a laughing stock in the Pac-12 is now one the better ones in the conference, giving up 323.2 yards per game, third best in the league. But other than excelling at a sport they are passionate about, the two have little in common. They certainly are aware of how different they are from one another. “He’s more finesse,” Weaver said of Kunaszyk. “I am more like, ‘Run into you, make you feel me.’ Be as physical as possible. Ever since I started playing football I want to hit somebody as hard as I can. Their position coach Pete Sirmon agrees. “They have different personalities that’s for sure,” said Sirmon. “But how we coach ‘em is the same. They both play really hard and have been really productive. In the meeting rooms they are really into football. Football matters to them. They share a lot of similarities. Their personalities are different but the traits that make them good are the same. An interesting aspect of their relationship is the way each remembers his first impressions of the other. The two took different routes to Cal. Weaver, the native of Spokane, was a target of several Division I schools, including both Washington and Washington State. He was a defensive end and defensive lineman. “And I played some running back, back in the day,” he said. “Running the ball scoring some touchdowns. That came in handy against Washington, (on his interception return for a touchdown). Kunaszyk is from the Sacramento area. He was always a linebacker, but did not play varsity until his junior year in high school. Under the Division I recruiting radar, he received interest only from Division II or NAIA schools. Determined to play D-1, he attended American River JC upon graduation from Roseville HS. His first year became a redshirt season because of an injury, but he blossomed in 2015, He led all California JC defenders with 118 tackles. He put in maximum effort, both on the field and in the film room. “I know I’m not the fastest. I know I’m not the biggest. I know I’m not the strongest,” he has said. “So, how can I have an edge on my opponent? I know I’m willing to do things that my opponents aren’t. And he received an offer from Cal, which he jumped at. He was an immediate contributor, playing in all 12 games off the bench in 2016. He took over as the starter for the last five games in 2017 and did well enough to get himself named third team All Pac-12 this preseason. In his career he has recorded 228 tackles, tops among active players. And he so impressed his teammates he was voted a season captain along with running back Patrick Laird. Weaver’s shining moment was the Oct. 27 game against Washington when he recorded 11 tackles and had that 37-yard interception return for a touchdown. Their respective physical appearances are as different as their playing styles. But where Kunaszyk with his neatly trimmed beard and steely stare looks the part of the thinking man’s player, Weaver’s rubicon cheeks and beaming smile do not resemble a football terror.